Labour have announced that Josh Fenton-Glynn will be their candidate for Calder Valley in the upcoming General Election, following a Labour Party NEC meeting today. Josh is a Calderdale councillor who represents Calder Ward and works for a charity. He lives in Hebden Bridge and has previously lived in Brighouse. 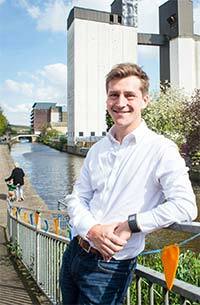 Josh also stood for the seat in 2015, when Calder Valley saw one of the biggest swings against an incumbent Conservative in the country and reduced the sitting MP's majority by over 2000 votes. Speaking on his selection as a candidate Josh said, "This election is an important chance for Calder Valley to choose between me - someone who will fight the corner for our constituency - or our current MP who voted against increased investment in flood defences just weeks after our community was hit by flooding. "I have a track record as an energetic and committed local councillor and an active member of our community, and I look forward to getting out on the campaign trail. Jane Rendle, Chair of Calder Valley CLP said, "We are excited to have a candidate who we know local people can believe in and Labour members are proud to get behind."